The ninth Summit of the Cambodia-Laos-Vietnam (CLV) Development Triangle Area (CLV 9) has reiterated the countries’ resolve to cooperate for sustainable and inclusive development in the Development Triangle Area. Prime Minister Nguyen Xuan Phuc addresses the ninth Summit of Cambodia-Laos-Vietnam (CLV) Development Triangle Area (CLV 9) in Siem Reap, Cambodia, yesterday. The summit in Siem Reap, Cambodia, yesterday brought together Cambodian Prime Minister Hun Sen, Lao Prime Minister Thongloun Sisoulith and Vietnamese Prime Minister Nguyen Xuan Phuc. Reviewing CLV collaboration over the past two years since the eighth meeting in Vientiane, the PMs applauded the achievements in key areas such as security, national defence, trade-investment, agriculture, and transport and tourism, which they said contributed to promoting socio-economic development and ensuring peace and stability in the area. They re-affirmed their commitment to forging CLV co-operation on the basis of time-honoured friendship, good and mutually beneficial neighbourliness, solidarity and mutual understanding between the countries. The leaders displayed their resolve to work closely with each other and team up with other ASEAN nations in materialising the ASEAN Vision 2025. They agreed to increase the connectivity of the three economies in both soft and hard infrastructure as well as people-to-people exchanges. They assigned the joint co-ordination committee to complete the action plan on connectivity of Cambodian, Lao and Vietnamese economies to 2030. The committee was also tasked with planning tourism development in the area. The agricultural ministries of the three countries were asked to partner with each other in building a plan on developing the rubber industry. The leaders affirmed their strong commitment to environmental protection, sustainable management and use of natural resources, including water and forest resources, and consented to implement programmes on co-operation in hydrometeorology, climate change response and water resource management. Joint efforts will also be made in bomb and mine clearance and the fight against drug smuggling, human trafficking, terrorism and cross-border crime. 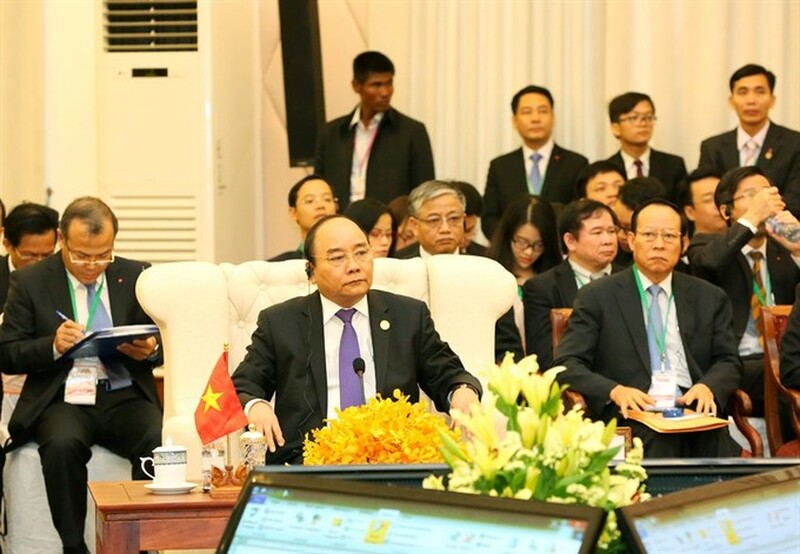 The leaders called for more active participation of the business community and development partners in CLV projects, and agreed to enhance their co-ordination with Mekong Sub-region cooperation mechanisms. PM Phuc called on Cambodia, Laos and Việt Nam to build a stable and open legal framework that facilitates the cross-border circulation of goods, services and labourers as well as investment in the CLV Development Triangle Area. He called for joint efforts in ensuring security and political stability, and environmental protection. The countries should coordinate with each other in realising the Sustainable Developments Goals by 2030, seeking long-term solutions to the sustainable use of natural resources, especially their shared water resources, and attracting resources from development partners and international financial organisations, he urged. PM Phuc also presented Việt Nam’s proposals for co-operation in the time ahead, including the building of mechanisms facilitating the free movement of vehicles registered in provinces inside the triangle area, the application of the “one-stop-shop” customs model at the Mộc Bài-Bà Vẹt international border gate in 2017, and regular dialogue mechanisms between Governmental offices of the three countries and businesses. Viet Nam will offer more vocational training scholarships to Cambodia and Laos, and increase the value of scholarships granted to Cambodian and Laos students, he promised. The Vietnamese Government leader called on the other two countries to join the Convention on the Law of the Non-navigational Uses of International Watercourses and, together with Việt Nam, consider participating in the Convention on the Protection and Use of Trans-boundary Watercourses and International Lakes (Water Convention). PM Phuc expressed his hope the three Governments will team up with each other to set forth a programme on official development assistance (ODA) mobilisation and another programme on joint investment and trade promotion. Viet Nam’s Viettel telecom group will invest in modernising the telecom networks in the three countries using 4G technology and help with the formation of their e-Governments, he said. In this regard, Cambodian PM Hun Sen suggested Viettel support the establishment of video links for the PMs and agencies of the three countries in an effort to make it easier for their exchange. PM Hun Sen spoke highly of the effective CLV cooperation, which helped each country maintain political stability, effectively prevent and fight crime, develop infrastructure, tourism and agriculture. He noted that the parties have promptly addressed arising problems and promoted trade. Both Hun Sen and his Lao counterpart underscored the need for the countries to enhance their multi-faceted co-operation to reach higher economic growth and maintain security and friendship in the Development Triangle Area. At the end of the summit, the PMs signed the CLV 9 joint statement and passed a list of 15 priority projects calling for investment in the development triangle area. The leaders also witnessed the signing of an agreement on trade promotion and facilitation in the CLV Development Triangle Area. The tenth CLV Summit will be held in Việt Nam in 2018.